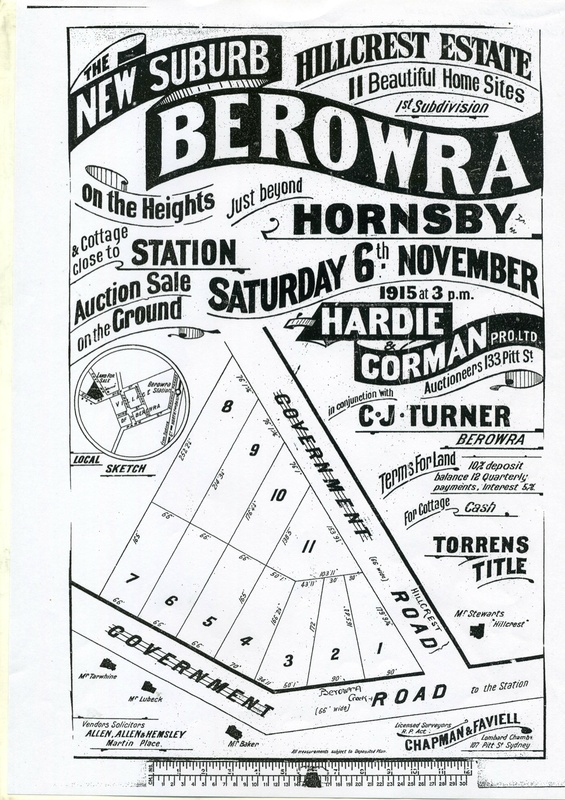 The following sub-division map, from the Local Studies Collection of Hornsby Shire Council Library, is a promotion for the early sale of blocks of land between what we now know as Berowra Waters Road and Hillcrest Road in Berowra. Hillcrest road is named after the property of Mr J Stewart noted on the lower right hand side of the map. C J Turner, whose name appears on the document also, was heavily involved with Berowra in earlier days and has a road named after him in Berowra Heights. By 1922 C J Turner was advertising an Auction Sale using the same sub division map as it seems only blocks 3 and 4 had sold by then.